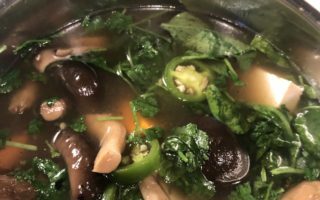 Home / Recipes / Autumn Series 2018 / Vegetarian Thanksgiving Gravy – Easy and Tasty! Hi, vegetarian carnivores! It is just a few days until Thanksgiving and I know that most of you are right in the middle of finalizing your menus. But here I am, and with a killer vegetarian Thanksgiving gravy recipe! I was going to put up this post in a couple days, but I just could not wait to share this beauty with you. As you all must already know, most gravy is made from beef stock or chicken broth. So while all the ingredients are usually meat free, the base itself is not vegetarian. 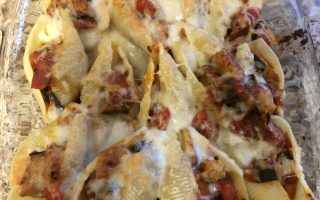 Trust me – I have had these gravies many times before, until I figured it out and I was absolutely so shocked to learn that there is always some kind of meat base. *Commence self guilt trip. * Anyway, after a couple years of trying to make a delicious vegetarian gravy (which easily becomes vegan with one easy swap of Earth Balance butter for regular butter!! ), I finally found something that I know you are all going to want on your tables this Thursday! Best of all, this is done using my love: the Instant Pot. Easy set up and clean up for the day of, takes no time at all, and leaves you all the kitchen space for the complicated stuff you are making! My secret weapons for this recipe are the Better than Bouillon “no chicken” base, as well as a hint of poultry seasoning. These give the base a really great deep flavor, which I love. And believe me when I say that without these ingredients regular poultry wouldn’t taste the way it did. I swear guys, it really is all in the flavoring and spices. 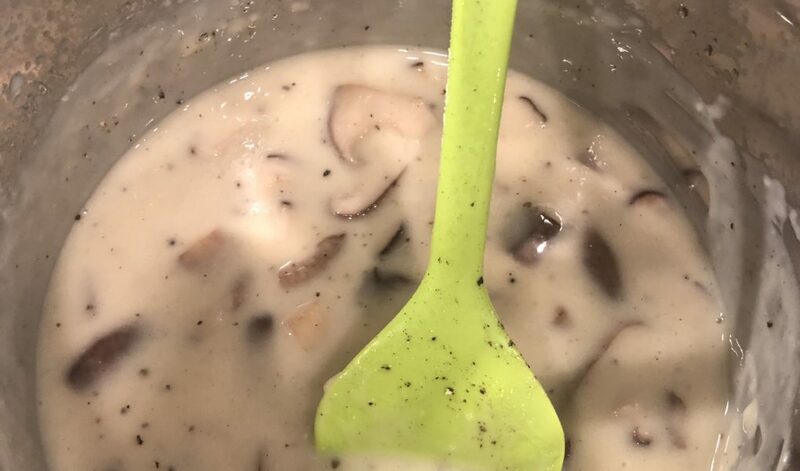 I also added in some sauteed shiitake mushrooms at the end because they have a chewy and meaty texture that are intended to add a contrast to the creamy gravy. My last secret weapon is the immersion blender! I took an immersion blender straight to my gravy during the mixing of the flour and it yielded such even and creamy results. I highly suggest you also try this incredible trick, but if you don’t have one don’t worry. You can get similar results by using a whisk and a lot of elbow grease. Set Instant Pot to saute mode. Heat oil and saute mushrooms until they are dark and have reduced. Take them out and save them. 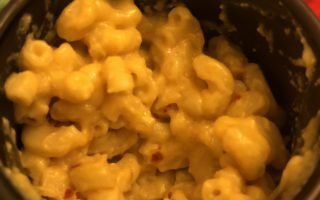 I did this in a saucepan and you can too, but if you want to keep it as one pot, then you can use the Instant Pot. Melt butter in Instant Pot and whisk in 3 tbsp of flour until fully mixed. Add in the bouillon base and water and mix until fully dissolved. Add in the poultry seasoning and keep stirring. When the concoction starts to bubble, observe the texture. If it is watery, add in flour one tbsp at a time and keep whisking. Take your immersion blender and cream everything together and break any flour lumps that may be lurking in your mix. Keep adjusting your consistency by adding flour one tbsp at a time to your mix. It took me 5 tbsp to achieve a nice thick and viscous consistency. When you have reached your desired consistency, add back in your shiitake mushrooms and let it simmer in the saute mode for 2 minutes. Your gravy is ready! Serve hot and enjoy! Some of the best gravy I have ever had, hands down! You guys all need to try this one out and tell me what you think. Did you all know that most commercial gravies have meat in them? Have any of you made the same mistake as me and actually eaten them and then guilt tripped yourselves? And after making this delicious gravy, how many servings did it actually last you? I am so excited to read all your comments and hope this ends up on your Thanksgiving meal list! Next ArticleVegan Pot Pie – Thanksgiving Leftover Lifesaver! I have a vegetarian family member and I’m hosting Thanksgiving dinner and was searching for ideas and glad I came across this post! I’m surprised you didn’t charge for your secret weapons as they are awesome. 🙂 I never knew that vegetarians are ok with using poultry seasoning as I thought it was against the vegetarian “rules” I know it doesn’t contain any animal products but wasn’t sure. Should i check with my family member first before adding the poultry seasoning or is it ok? I am glad you brought up the poultry seasoning question: it is literally a mix of thyme, sage, pepper, marjoram, nutmeg, and rosemary, so it is completely vegan! I guess it is marketed as poultry seasoning because people season their chicken with it? But its individual components are simple spices that you can even mix together yourself, if you like! Thanks for your comment and I hope to see you back soon! I was struggling to make gravy the other day so I’ve come across your article at an opportune time! I particularly appreciate that it is vegetarian because we have a mix of carnivores and herbivores at our Thanksgiving table every year! 🙂 And I always struggle to put something together to cater for the different dietary preferences. By the way, your recipe mentioned a hint of poultry seasoning … is that still okay for vegetarians? I’m starting to love the vegetarian options people are coming out with. It’s increasing our healthy but delicious options at the dinner table. Thank you for sharing! Hey Cath, I am so glad you found a solution to your problem with this post. Carnivores will love this recipe as well because it has the same flavoring as traditional meat base, so you won’t have to make a bunch of different kinds of gravy! Poultry seasoning is a mix of sage, thyme, nutmeg, rosemary, pepper, and marjoram, so it is totally vegan and ok to use! Thank you so much for your comment and I hope to see you back here soon! Hi Cass! It’s great to see you back here- it means I am doing something right 😉 I do have a lot of meat lovers tell me that they will be trying out my dishes and that is such a wonderful compliment for me to get! When a meat lover willingly tries out vegetarian/vegan food I know I am doing a good job! Thanks again, Cass and see you here again soon! Hey there Janani, oh my goodness what delicious looking gravy! I did not know there is meat in most store bought gravies! It just shows how important double checking the ingredients label is – something I don’t do often enough because I tend to just assume instead (facepalm!). Sometimes the things we discover on there is scary! For the recipe, I’ve heard shiitake mushrooms are legendary but I can’t find them locally – how do you think it will come out with regular mushrooms as a substitute? Hey Nadia! Thank you so much for your comment 🙂 Meat is indeed present in a lot of store bought (and restaurant dishes in the broth for lots of pastas and risottos!) goods. Shiitake mushrooms are wonderful, but this recipe will turn out beautifully with button mushrooms or bella mushrooms too!